Tore Andre Flo believes Ruben Loftus-Cheek's call-up to the England squad for the 2018 World Cup could give him the impetus he needs to become a first-team regular at Chelsea. Loftus-Cheek is highly regarded at Stamford Bridge, but he spent the entirety of the 2017-18 season on loan at Crystal Palace after struggling for game time. Flo works in Chelsea's loan department and travels extensively, watching the 37 players who are currently away on temporary deals. He believes Loftus-Cheek has all the talent in the world, insisting that he must grab his chance in Russia with both hands this summer. “I really have high hopes for Ruben,” Flo said, as he answered Goal’s questions at William Hill’s pitch day at Stamford Bridge. “He is a brilliant player and I have been following him through his years in the academy as well. “He seems to have taken that step well into senior football. He is very very exciting and I hope he gets his chance at the World Cup and that he takes it. He has definitely got the potential and he is exciting to watch. He might be ready for Chelsea, that’s up to the manager to decide, I guess. “I think it is something that we will continuously discuss. 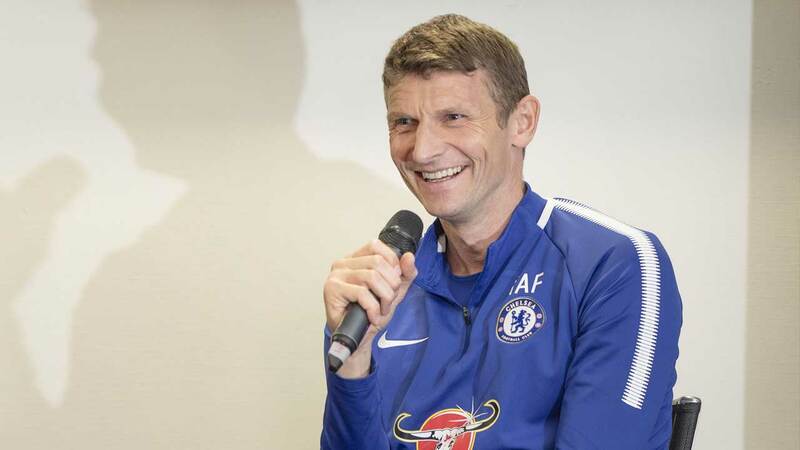 He is one of those that we think might be ready, we need to have the manager in on that, with a good World Cup again he could really be in the Chelsea squad again but it is not for me to say, yes or no on whether he will definitely do it. Another who has made an impact away from Chelsea is Mason Mount, who scored 14 goals and provided 11 assists in a loan spell with Vitesse. Voted Chelsea's Academy Player of the Year in 2017, Mount has also caught the eye of Gareth Southgate, who called the 19-year-old up to train with the England senior players last week, something which Flo, who scored 70 goals for the Blues, takes great pride in. “Yes, it is a very very proud moment. He has done so well there especially in the second part of the season. This was his first loan and the first time in senior football, it took him a little bit of time to break into the team at Vitesse where he played, but from then on he was brilliant. Mount was ranked in the top 50 teenager footballers in the world by Goal back in March in NxGn 2018.